The instant I saw this photograph I realized I was seeing something so beautiful, I’d have a hard job writing something to accompany it. 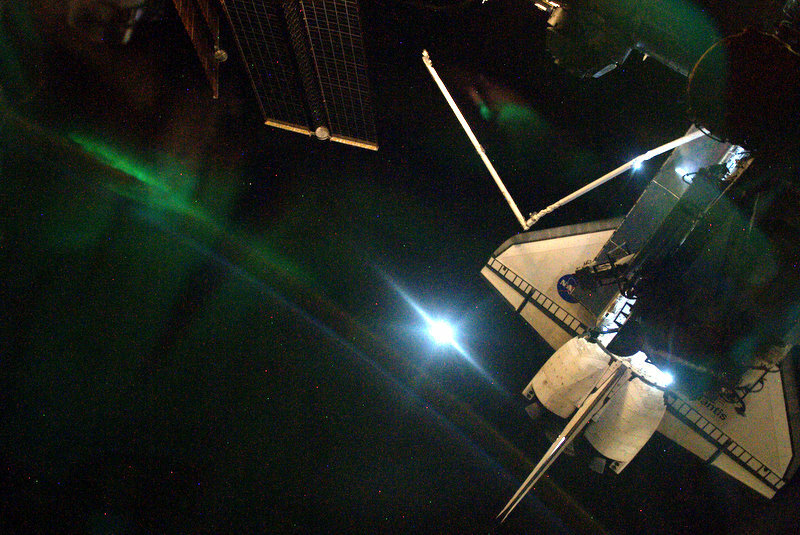 Coming straight from the Twitter feed of Soichi Noguchi, Japanese astronaut and social-media-in-space-photography-guru, this single photograph has captured the moon, an aurora hanging above the Earth’s limb, a docked space shuttle Atlantis and the International Space Station’s Kibo module (plus a bonus robotic arm and solar panel). This picture is awesome on so many levels. And to be honest, this should be the photograph of Atlantis’ final mission. It encapsulates so much; a testament to what mankind is capable of and a tribute to the men and women who are currently in space, risking their lives for the advancement of our race. There’s not much else to say, except: wow. 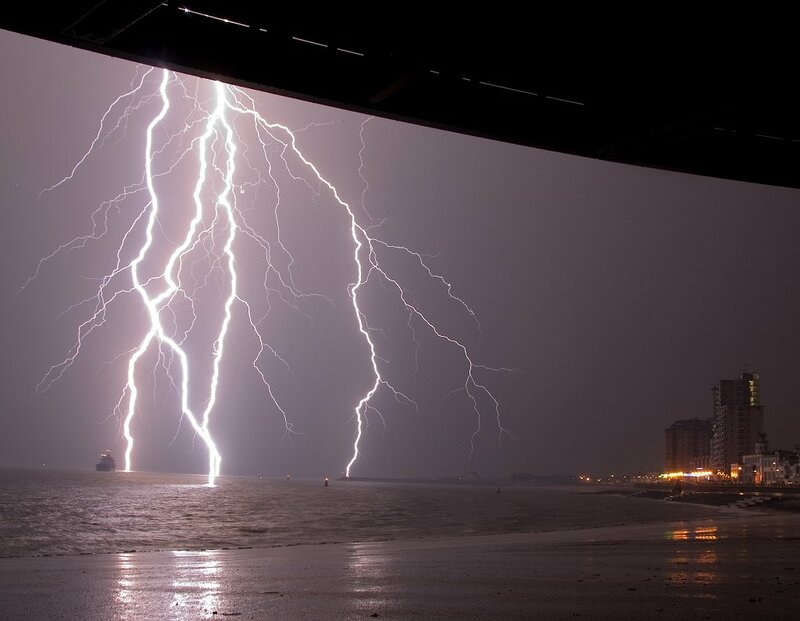 Author Ian O'NeillPosted on May 22, 2010 Categories Coolness, Featured ArticlesTags AstroPhoto, Astrophotography, Atlantis, Aurora, International Space Station, ISS, Soichi Noguchi, Space Shuttle6 Comments on Awesome. When I came across this image in NASA’s Human Space Flight gallery, I stopped. I was looking for the “perfect” shuttle image during the STS-128 mission to the International Space Station earlier this month, but I got sucked into browsing through the hundreds of EVA photographs NASA has stockpiled in their archives. This particular scene was taken by NASA astronaut John "Danny" Olivas when he was out on a spacewalk installing a new Ammonia Tank Assembly. The EVA was over six hours long and Olivas was able to do some digital photography in that time. 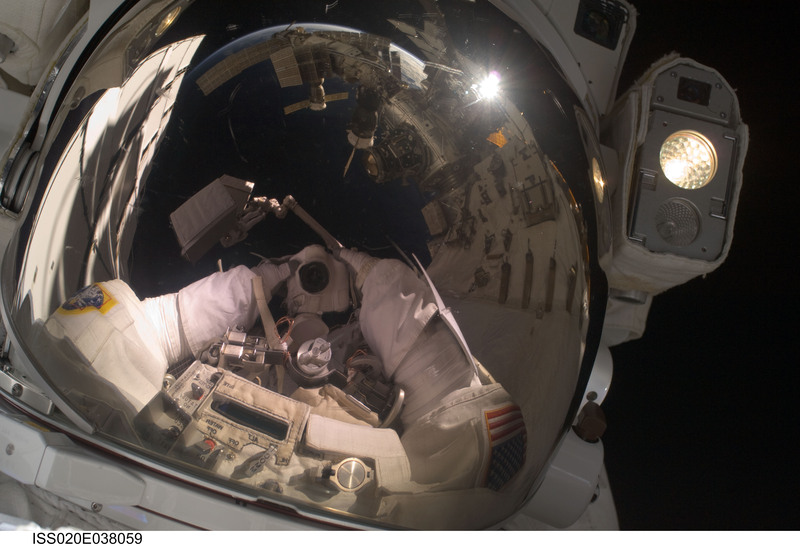 This picture shows his spacesuit helmet visor, with a reflection of the camera at arms length below. The reflection captures so much detail. The curvature of the Earth can be seen in the distance, with space station solar arrays jutting in front. Even the two docked Soyuz vehicles (TMA-14 and TMA-15) are in shot. To top it all off, ESA astronaut Fuglesang is dangling in the vacuum of space attached to a robotic arm. Yesterday, at 5.48pm PDT, I witnessed a shuttle event for the first time. Following the 13-day long STS-128 mission to the International Space Station, shuttle Discovery had to be redirected to land at Edwards Air Force Base, about an hour north of Los Angeles. I knew there might be a good chance that I’d hear the shuttle’s sonic boom as it passed over LA County, but I wanted to see the approaching shuttle too. Unfortunately, it was one of the few days that there was low cloud patching the sky, so the chances were slim. Either way, I had a good chance of hearing the sonic boom if I got outside and listened very hard. I was told on good authority (by ace Discovery Space correspondent Irene Klotz) I should be able to hear the shock wave about 4 minutes before touchdown. There was 6 minutes to go, so I ran outside to listen out for the distant thud of Discovery slamming though the atmosphere 14× the speed of sound. Distant thud? Are you sure about that, Ian? Stupidly, I was balancing on a chair, shading my eyes in the hope of seeing a little dart-shaped shuttle through the clouds… with my laptop under my other arm so I could hear the NASA TV commentary a bit better. Not smart. I nearly jumped out of my skin when I heard that! I’m amazed I didn’t drop the laptop and fall off the chair, it really was that loud. Almost like a bomb going off. Once I put the computer down on a more suitable surface, I shouted “Holy crap!” (on Twitter too). I was shaking a little. I heard the neighbours chatting about the noise; a car alarm was sounding and dogs were barking (hence the reference to the funny title, as said by @08HD_DynaSGC). I’d just heard the space shuttle, pass overhead, after spending 13 days orbiting the Earth, docked with the space station. Would You Like a Slice of Moon with that Solar Observation? 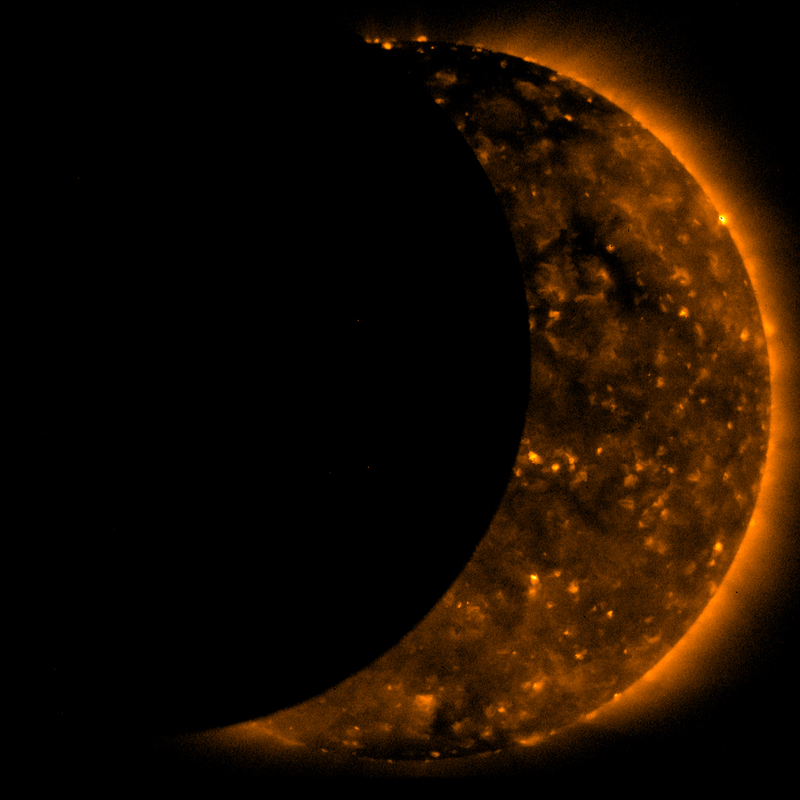 The Hinode view of the eclipse (JPL/NASA). On July 22nd, Asia witnessed the longest solar eclipse of the century. I saw the pictures, it looked like fun. I’ve only seen a partial solar eclipse in the past, so when I heard about last week’s eclipse lasting nearly 7 minutes, I was more than a little envious. So another eclipse, another momentous event if you could witness it, but if you couldn’t, at least you had some nice pictures to look at. However, there seems to be one forgotten spectator who had the best seat in the house to watch the moon pass in front of our Sun: the Hinode solar observatory. Hinode (meaning “Sunrise”) is a space-based observatory launched by the Japanese space agency JAXA in 2006, and since then it has changed our perception of the inner dynamics of the solar corona. It can image the fine-scale magnetic structure of coronal loops and track plasma features with astounding precision. 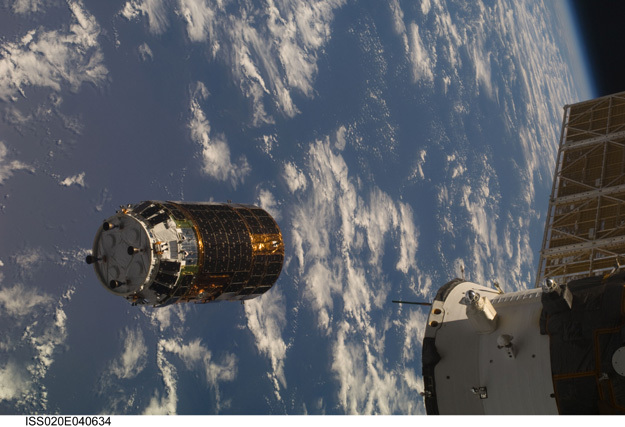 On Wednesday however, Hinode caught an entirely different feature in its lens. Actually, I’m a little surprised there’s not much of a fuss about the eclipse from space. Admittedly, the lunar transit across the solar disk didn’t attain totality, but it sure looks amazing! Author Ian O'NeillPosted on July 25, 2009 Categories Featured Articles, Moon, Solar PhysicsTags AstroPhoto, Hinode, Satellite, Solar Observatory, Totality4 Comments on Would You Like a Slice of Moon with that Solar Observation? Wow! I thought the single image of the volcanic eruption (plus shock wave) was cool, but after seeing the complete series of images put together in this animation, I’m literally blown away. Thank you Richard Drumm for sharing the video on Twitter — now this is one YouTube video that needs to be shown off. 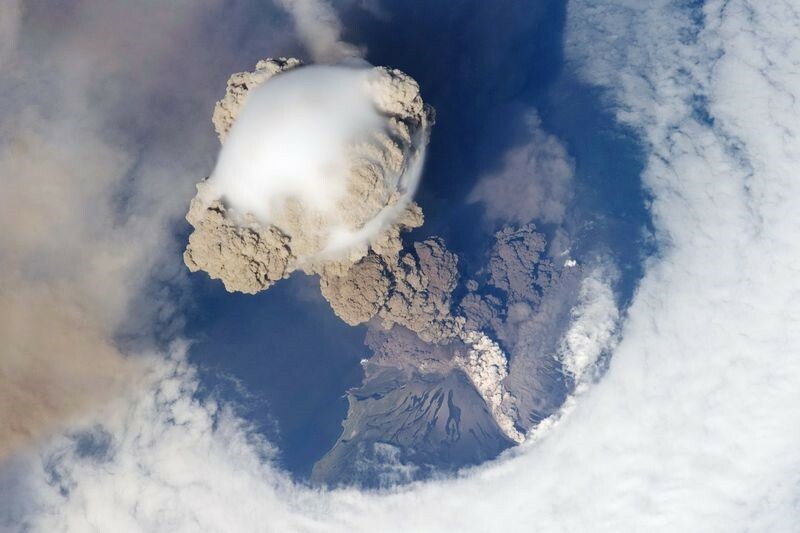 The 29 photos in this animation were taken by space station astronauts as they passed over Russia’s Sarychev Peak volcano in the Kuril Islands. Discovery Space Quiz: Dalek Mothership? For my first Discovery Space Quiz, I was sent a selection of images from the Lowell Observatory StarTales Archive. On looking through the selection this week, one image grabbed my attention and I decided to use it in the monthly “What Is That?” quiz. So what is it? The insides of a Dalek spaceship? A new hi-tech observatory? A washing machine drum? Author Ian O'NeillPosted on June 6, 2009 Categories Discovery Space, Featured ArticlesTags AstroPhoto, Discovery Space, Quiz2 Comments on Discovery Space Quiz: Dalek Mothership? It’s pictures like these that make me a) want to do more photography, b) feel more in awe of nature than I already am, and c) wonder how the photographer didn’t pack up his gear and run away screaming. 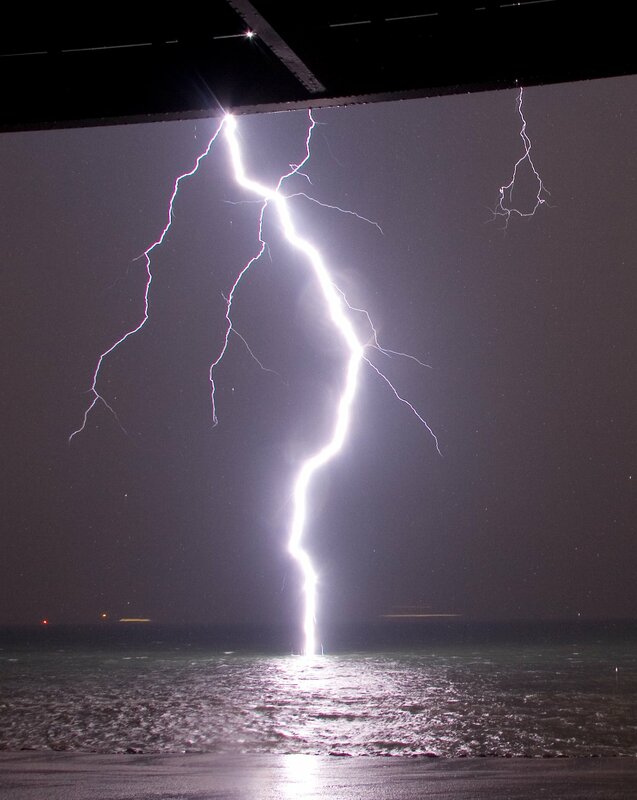 But thank goodness the talented storm chasers didn’t run away, they actually witnessed a very rare event, up close. Let me emphasise that last bit: underneath a balcony. Balls of steel comes to mind. For me, nothing less than a reinforced bunker surrounded by lightning rods will do. Streamers reach upward from the water. It’s hard to imagine if this streamer phenomenon has been observed to reach out from water before, but this Dutch example must be very rare. 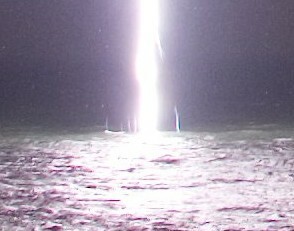 It’s hard enough to photograph lightning streamers on solid ground, let alone on the surface of a body of water. Thierry Legault is one highly skilled astrophotographer. 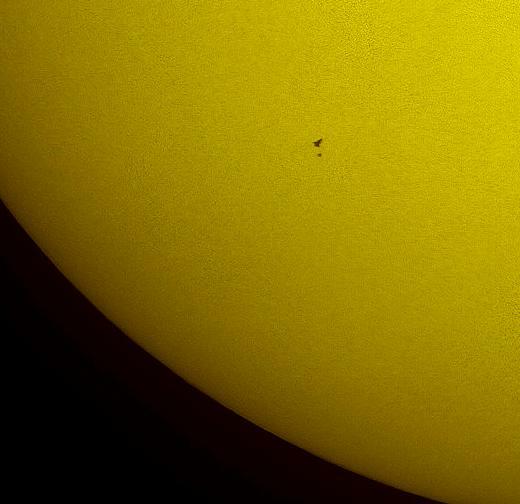 The transit of the Hubble Space Telescope and Space Shuttle Atlantis took only 0.8 seconds to clear the disk of the Sun, so Legault rapidly took four pictures per second, starting his series of pictures two seconds before the pair were predicted to pass in front of the Sun. In the image above, the 35 meter-long Atlantis is easily identifiable, but the tiny speck of the 13 meter-long Hubble isn’t so easy to define, but the result is superb. 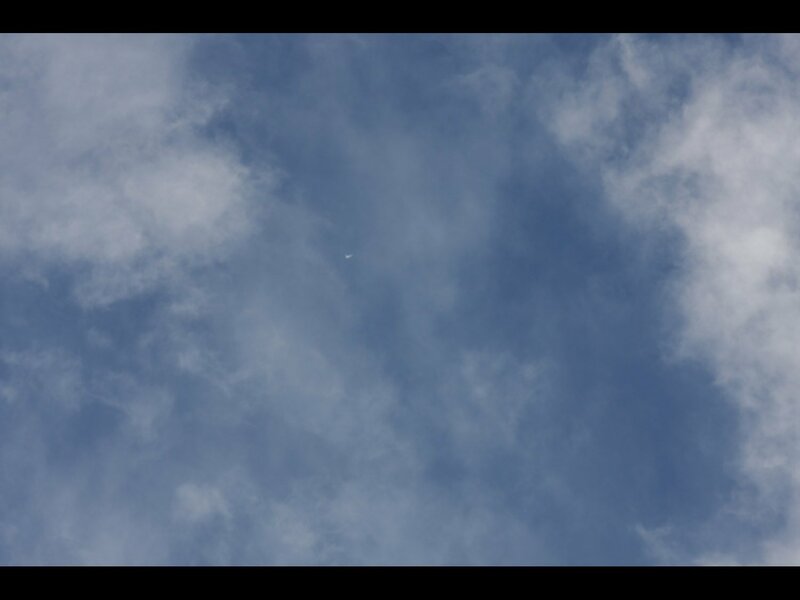 According to Legault’s website, this is the only picture of the STS-125 and the observatory, orbiting at an altitude of 600 km. 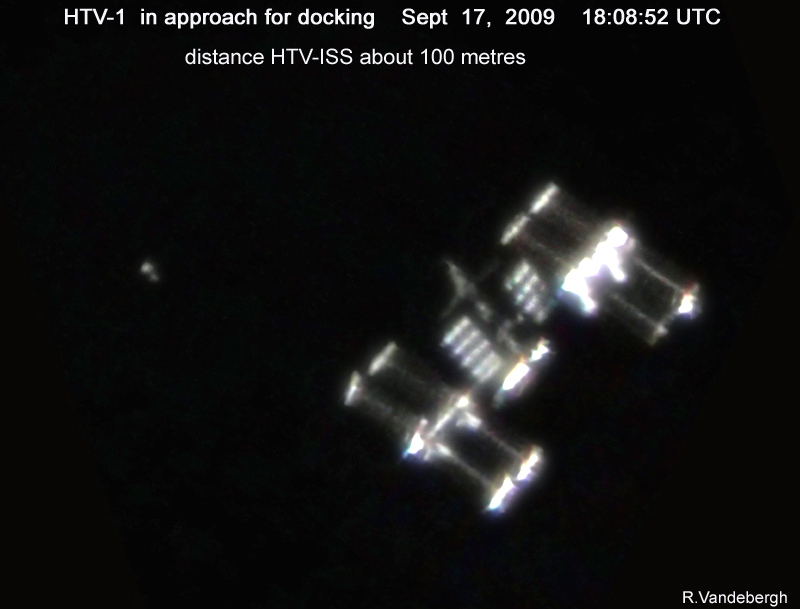 Back in July 2008, Astroengine reported on the transit of the International Space Station across the disk of the Sun. 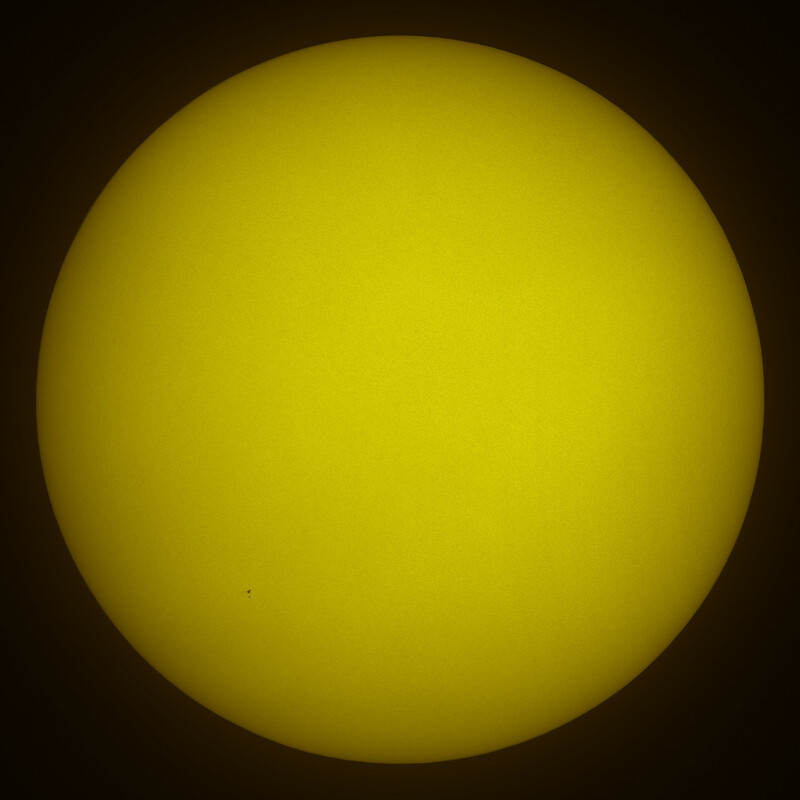 Fortunately, in both cases, the Sun’s face was blank, and no sunspots are prominent enough to ruin the view.